Some of the biggest new-parenting blows came from the thought that I couldn’t believe that nobody (at least not in my direct life or circle) had ever shared what having your first baby can actually feel and be like. Nowhere on social media was I seeing these seemingly “dark side” of being a brand new parent that was showing up in my own life. Granted, I know that everyone’s experience is so so different, which could attribute to the lack of sharing and TRUST ME, I also know first hand how much you don’t feel like announcing things to the world when you’re right in the thick of it; but, I remember thinking over and over again when Birdy was just a few weeks old, thoughts like “why didn’t anyone tell me this would happen?” or “how are we just left with these babies and expect to figure this all out”, and so so many more thoughts and feelings that I just didn’t know what to do with. I want you to keep in mind though that I didn’t just snap my fingers and one day the darkness just lifted and I felt good enough to share every little piece of what was going on publicly. I wouldn’t and couldn’t have made it through that alone; that’s the whole point of all of this. It was Mark who pulled me out of everything, and it wasn’t until I feeling as though I was making progress through the never-ending postpartum tunnel, that I even begun to think about finding my voice to share my journey. With my own journey through postpartum depression, I remember feeling totally lost and isolated; if anyone has or was feeling similar things as myself, then why wasn’t I hearing about it? And beyond that, why did I feel as though I had to struggle in isolation as well? When it comes to mental illness, for me the biggest self-implemented stigma was not knowing what others would think of me if/when I shared how I was feeling. I will never ever ever forget scrounging up the courage to even talk about it with a friend of mine, and the unbelievable relief I felt when--after listening to me explain my thoughts and feelings--she just held my gaze and nodded, stating that she too understood completely. There was no uproar, or gasp, or widened-eyes. There was just complete and total understanding. It shocked me in the most positive and relieving way. That is what the world needs more of, not even understanding, because i don’t think that we should pretend to understand when we don’t; but rather just unwavering empathy. I promised myself--once I was feeling more like myself months and months down the road--that I would do anything in my power to lessen those feelings of complete isolation, and that I would use whatever platform that I could simply to share my own story and voice so that if nothing else, we could all feel a little less alone. Mark and I recorded a two-part postpartum podcast episode last year with our old podcast Gather + Grow, and I’ve contemplated bringing them over on this platform as a second home so that they can be listened to again if that’s something that anyone needs, because I honestly don’t feel like those experiences simply can’t be shared too many times. Regardless, for the time being, if you want to hear more about that part of our journey, I’ll leave those episode links in the show notes for you and you can listen-in if you’d like. My segway here, is that I think my desire to make us all feel less alone transcends into another area of being a parent that I feel like needs to be talked about more than it is, and that is the reality that sometimes we come to the realization that even though we made the decision to become parents-and yes of course that was a choice that we made for ourselves and our lives-that being a stay-at-home parent isn’t something that’s for me, nor is it something for Mark either. But what now, right? How can we make that decision AFTER already jumping right in and BEING a parent already? I didn’t know that I was ever allowed to say aloud that being a stay at home parent isn’t the role for me. The strangest part in that, is that it doesn’t necessarily feels like it comes from an expectation from anyone in my own personal life, but rather some deep ancestral pull that isn’t allowing me to admit that to myself or anyone else. On top of all of that, being we chose to create a family that expands outside of just the two of us, I felt weighted down by the made up truth that being a stay at home mom was my responsibility, and that there’s nothing else I can do about it at that point. Even though the balance is near impossible to strike, Mark and I HAVE come up with a system (it only took us just about two years haha) that actually gives us both the space that we’re needing and craving, both with Birdy as well as for and with ourselves. I’m slowly but surely learning that I am not ancestrally-responsible to tackle being a stay at home parent all alone, and on top of that, I am allowed to--and supported in--the desire to simultaneously pursue all the creative entrepreneurial pursuits that have always felt like home to me. 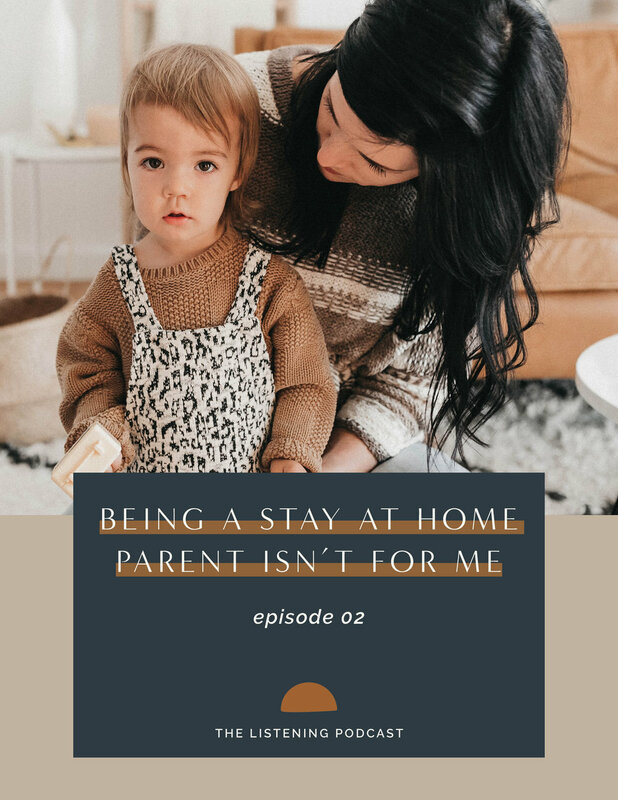 Truth be told, there are days where I long to be that person who really sinks into their role as a stay at home parent; eager to embrace all aspects of the rewarding and tirelessly challenging journey that comes along with raising children. I’ve walked a small sliver of that path for the first six months of Birdy’s life while Mark was still at his full time job--prior to the pivotal point in my own struggle with postpartum depression--where every waking minute was given to keeping a baby alive and well. Granted, there were so many other aspects happening all at once for me during that time; but if nothing else during those unbelievably dark days, I gained a little bit more insight about myself, whether I wanted it or not. If there was a way that I could take a pill and become another person entirely--one who doesn’t feel suffocated at the thought of never being able to work again, or who steps into that parenthood power with a calmness and heart of unwavering grace and powerful moments of strength--I think that I would take it and just live in that space for a little while; but the older Birdy becomes, the more I’m being aware that wishing away who I am for someone that I am not, doesn’t fulfill the paths that we have all chosen for ourselves. By limiting pieces of who I know myself to be in order to try and be someone I am not, I am deservicing the contract that Birdy’s soul made with my own long before her journey to Earth. Nobody has all of the answers, otherwise none of us would be here; but, we are shown steps towards our truth with every decision that we make to step into the discomfort, rather than to run from it. So how are we making it work and what is this magical plan that we’ve come up with? Up until creating this new schedule, Mark had stepped fully into the role of full-time-parent, but the longer that we lived in that routine, not only was it becoming clear that he was having to put his own life and dreams on hold, but I was also becoming increasingly guilty for having the space and freedom to do something that I absolutely loved every single day, five (or more) days a week. We decided this past November, that if we have the freedom to literally CREATE the life that we dream of living, why haven’t we already been working to create and live it right now? It seems so simple, but up until that point the path just wasn’t clear to us. We decided to split our week up right down the middle, giving us each 4.5 hours a day for work, or to do literally whatever else we want to do ourselves, and then 4.5 hours of dedicated Birdy time, before joining all back up for dinner and the evening. Tune into the episode to hear a little more about how this new routine is already making us feel, just a few weeks in. Where Did My Clients Go?